Combined 1 scoop of Green Magnitude with 6-8 oz of water for a sweet/tart taste or 12-20 oz of water for a more tild taste. Consume the entire shake pre-workout of half pre-workout and hlf post-workout. Shake well before drinking. For best results, GreenMagnitude should be used in combination with other Controlled Labs products. At least 1-2 gallons of water per day, a high protein/moderate carbohydrate diet. 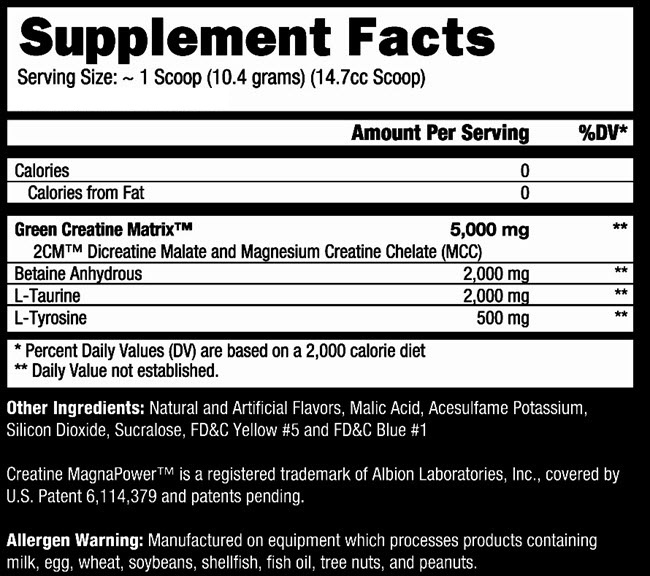 Natural and Artificial Flavors and Colors, Malic Acid, Acesulfame Potassium, Silicon Dioxide, Sucralose.